As you may already know we have been big fans of Drumond park games and have been reviewing them for a few years. Drumond park have a lovely range of games suitable for all ages. Our latest game from Drumond park is certainly a little different to others we have. 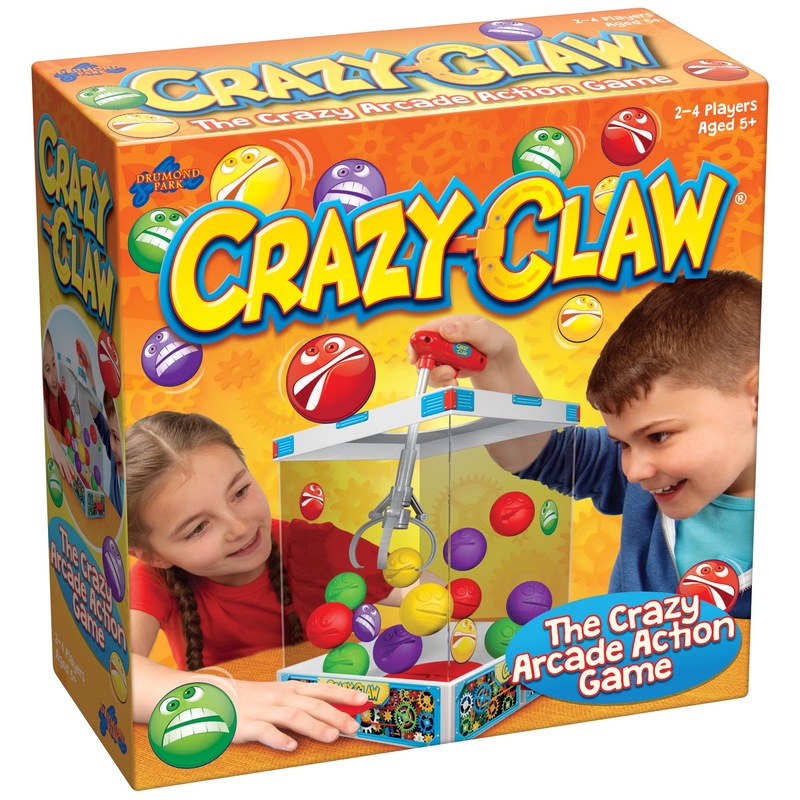 It is called Crazy claw, the concept being based around the arcade grab games. It is not a battery operated game and it does require some minimal setting up. 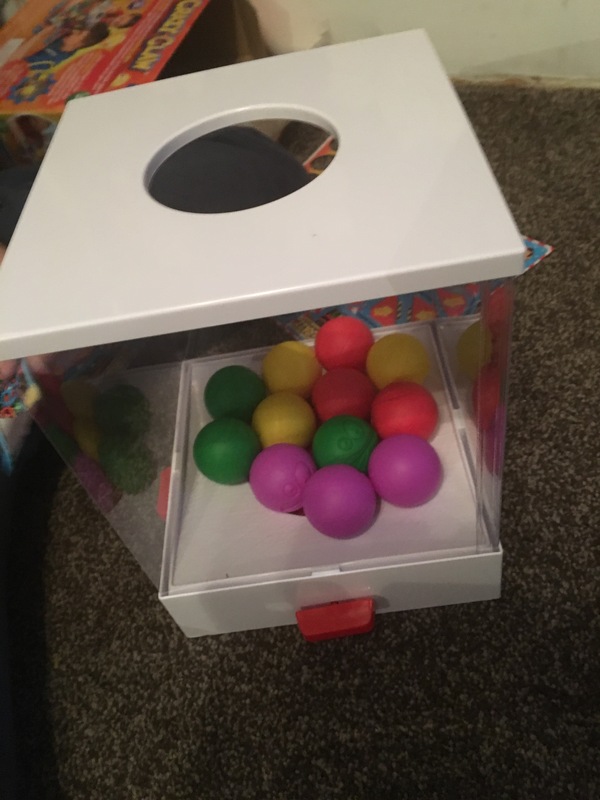 We had to build up the plastic box, this is then filled with coloured balls. As you can see on the picture above; each of the four sides has a red paddle. 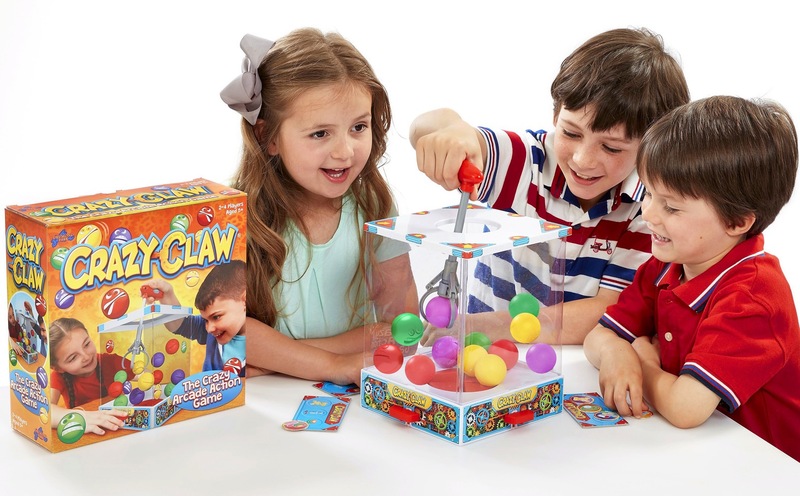 The game also comes with a manual claw and four game cards. Each card has images of toys on it, and to play is a little like bingo. The balls contain toy tokens, but some of them may be empty. The player inserts the claw onto the top whole and attempts to grab a ball with it; whilst the other players frantically tap away on the pedals to make the balls bounce around. If a player gets a ball and a toy token is inside, they then check their playing cards to see if the token is a match to one of the images. If it’s a match the token goes over that image and if not then it goes back into the ball and back into the box for the next players go. Of course the winner is the first to fill their card with tokens. If I’m being honest, this is not the sort of game that I particularly like to join in with although I did have a try. My children however love it and get it out most nights. Four people can play so it’s pretty ideal if you have three children like myself or even four. The age guide is 5 and over. In my opinion I think this could be lowered to 3 or 4 years. Izebella is almost 4 and knows how to play it better than I do. There aren’t really any tiny parts to worry about, the balls obviously open up in half but I don’t see why younger ones can’t join in. Ryan being 12 has had a few goes too but I think it’s more suited to younger children under 10. Once play is finished the box can easily be taken apart again and stored back in the box with the balls. RRP for this game is £22.99. Drumond park are giving away one copy of the crazy claw game. The winner will receive this in plenty of time for Christmas when it’s sure to be very popular. All you need to do to enter is click the link below. This giveaway will end on October 28th 2016. One winner will be chosen at random and will have 14 days to reply to a winning email to claim their prize. Prize sent directly from Drumond Park. Please allow up to 28 days for delivery.